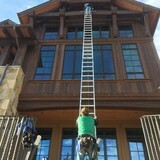 The Clean Up Group is a locally owned and operated window cleaning company serving Eagle County Colorado including Vail, Avon, Beaver Creek, Cordillera, Bachelor Gulch, Edwards, Arrowhead, Red Sky Ranch, Eagle, and Gypsum. We specialize in both residential and commercial window washing, and are insured and equipped to service up to eight-story buildings. Our crew is made up of three hardworking local Vail professionals. We are grateful for the opportunity to provide both a valuable service within our community and a positive contribution to the local economy. We strongly believe quality work requires a positive attitude, and window cleaning is no exception. We would love an opportunity to show what Clean Up Group window cleaning can do for you!